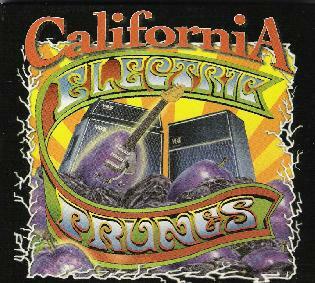 The Electric Prunes - "California"
This collection of songs reflects our memories and experiences of a better time. A time of innocence and rock and roll. A time when people still believed you could find gold in California. Could such a place still exist? That's the phrase that graces the inside cover of The Electric Prunes new CD, California. I'll assume that all our readers know The Electric Prunes, even if it's only to recall their 1967 psychedelic classic, "I Had To Much To Dream (Last Night)". And note this isn't one of those faux reunion situations which only includes one original member justifying the name. No sir... original members James Lowe, Mark Tulin and Ken Williams are on board, along with 1968 lineup drummer Joe Dooley and more recent member, guitarist Mark Moulin. So does the place still exist that the Prunes pine away for? It does on this album. We've got a solid collection of well written, catchy songs. A sense of fun pervades throughout the album as the Prunes plow through a rockin' set of numbers that blend the California sound they seek with good ‘ol down ‘n dirty psychedelic garage rock. There some great psychedelia on the album, one of the highlights being the rousing garage-psych freakout cover of Tom Petty's "Makin' Some Noise". These guys must be big Petty fans because a lot of the songs have a bit of a Tom Petty feel, though the Prunes take "Makin' Some Noise" completely into their own realm. "I'll Drag You Home" and "Rosy Made Me Crazy" are funk ‘n roll tunes with plenty of the old time Prunes garage rock and bubbly, wah'd and deliciously freaky psych guitar. "49 Songs" is a fun and funky song that tells the story of a California musician chasing girls while on tour in Europe. "The Rickenbacker 12 String" is one of my favorite songs of the set, with hints of the 60's in the sound and sweet memories of those days in the lyrics. "Cinema Verite'" is another highlight, with a stoned vibe, robotic percussion patterns and tasty whining slide guitar. There's also a number of standout tracks that I enjoyed as being solid grungy hard rock songs, particularly "I Never Knew What You Wanted", "Pacific Ocean Blue" and "Rewired". Finally, we get a bonus track with Peter Lewis of Moby Grape "attempting" to record a spoken bit for Little Steven's Underground Garage. Pretty hysterical. It's always great to hear pioneering bands from the 60's who have grown and developed over the years, still making great music. I just checked out the Electric Prunes web site to see if any tours are in the works and sure enough there seem to be plans for the Fall. Keep your eyes - and ears - peeled. For more information you can visit the official Electric Prunes web site at: http://www.electricprunes.net. There's also an info packed fan site at: http://www.electricprunes.com.